It takes a certain type of person to devote an entire career to chasing something she’’ll probably never find. One such person is Jill Tarter. 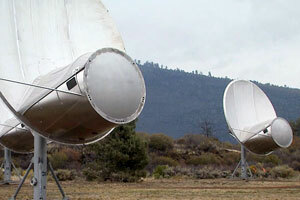 Tarter is the director for SETI Research at the SETI institute in Mountain View, California. She’s also the inspiration for the Jodi Foster character in the 1997 movie Contact, based on the book by Carl Sagan. In real life, Jill Tarter’s career at SETI has been a lot less momentous. In her 60s now, with her gray hair in a short, no-nonsense cut, Tarter says she knows she may not hear a signal from intelligent extra-terrestrials in her lifetime. “I don’t know whether anyone will ever find a signal,” she says. Listen to the QUEST radio story Is it Time for SETI to Stop Looking? Back when Tarter joined SETI, the project was funded by NASA. But that support ended in 1993. Since then, she and others have spent almost as much time searching for money as they have searching for ET. Three years ago, SETI celebrated what felt like a turning point: the opening of the Allen Telescope Array, near Redding, California. Before the Allen Array, Tarter and other SETI scientists took their equipment around the world, borrowing time from telescopes owned by other institutions. But with Allen, which was constructed with money from Microsoft co-founder Paul Allen and is jointly managed with the University of California, Berkeley, SETI scientists could scan the skies full-time, hoping a clear, tell-tale radio signal would distinguish itself from the universe’s background hiss. Tarter is the first to admit that this may never work. She says SETI is searching the cosmic haystack for a needle that might not even exist. Ben Zuckerman, a professor of astronomy at UCLA, is skeptical humans will ever find intelligent extra-terrestrials. Zuckerman didn’t always feel this way. In grad school, he studied with Carl Sagan. He even worked on some of the early radio searches back in the 1970s. But then he started to have doubts. Then there’s the problem of timing. If intelligent ETs are out there, what are the odds that their signals would reach Earth at the precise moment in cosmic history that we happen to be listening? Recently, something happened that gave critics new hope: NASA’s Kepler Mission, a program designed to survey the Milky Way galaxy in search of Earth-size and smaller planets, delivered its results. Kepler found what it was looking for: More than a thousand planets orbiting distant stars like our sun. Dozens of them are thought to be roughly Earth-sized. Of those, some may turn out to have climates that could be hospitable to life. Dimitar Sasselov directs Harvard’s Origins of Life Initiative and is also a member of the Kepler team. He says Kepler has given SETI something it never had before: targets. As of April, that list has been filed away for future use. SETI’s Allen Telescope Array is officially in “hibernation.” Tight budgets at the state and federal level have left UC Berkeley without enough money to operate the telescopes. Sasselov says it’s a shame. Jill Tarter says it would cost $5 million and two years to systematically go through the Kepler planets, listening for radio signals produced by an intelligent civilization. She’s looking for private money to make it happen. Zuckerman says it’s a long shot. Maybe the longest long shot in the history of science. But the payoff? There are hundreds of billions of stars in our Milky Way galaxy alone, and hundreds of billions of galaxies. Tarter says someday, it may make sense to stop looking, to come to what she calls the “extraordinary conclusion” that we really are alone. My personal view is that we have someone trying to listen to us all or already listening. How does one know? I keep hope! If there is a chance at all then I think we will be found by someone. I would be interested more in figuring out if human mind can do what arrays cannot.. just a arrow in the dark. Allen will start again one day! They do not listen us they read our thoughts. SETI is like using Morse telegraph to contact someone using G4. The SETI-project should never stop! We have pulled a single glass of water from the ocean and found it has no fish in it. Are we to assume the ocean is devoid off life? Absurd. I think it’s to early to stop a project so important. Specially with the tecnology there is today, it’s maybe the best moment to start. The question asked: Should SETI Stop Looking? Does it really matter? We have a Congress that is trying to destroy this nation and you want to know if SETI should stop looking? You watch Contact and you hope there is life out there. You listen to Liberals and they hope there’s not. That way they can stop spending money on SETI. Until America wakes up to the corruption in Washington there should be no funding unless it is private. Get SOROS or GATES to fund it… They want to spend their Billions on something. They say that all the time in the news…..
@ sandmannc40: SETI has been supported on donations for years. By & large, astronomy is a non-political issue; the closest SETI got to being political was when Senator Bryan-a Republican, I note-brought an end to funding from NASA on the grounds that SETI was a waste of money. SETI should must looking for extraterrial life, I think we are not alone in this big and hug universe. Let’s hope and we will find. Yes, SETI should STOP! Besides the evidence that ETs have already been here among us for many years now, perhaps centuries, NASA has already came across their crafts during the Apollo missions and before, during, and after the landing on the moon. In fact, recently, the SETI Radio Telescopes in Puerto Rico had already received feedback signals at 3 different times between the Aries and Pieses constellations just last year of 2014. Not to mention Australian scientists picked up what they call “FRBs”. (Fast Radio Bursts) in 2001 and ten have been detected so far, most recently in 2014 in Parkes Telescope in New South Wales, Australia. Our history even tell they’ve been here. Ever heard of Roswell New Mexico UFO crash of 1947? How about 5 years earlier on the date of February 25, 1942? A date in time marked as ” The battle of Los Angeles.” And not to mention Route 303 in Lajas Puerto Rico known as UFO Highway. We are lucky that the ETs here are kind of friendly not to interfere with our lives, but let me tell you. Some are not very friendly and those are the ones to watch out for. Cattle mutilation, abductions, and experimentations on us like we’re just lab rats to them. Thousands of Americans and across the world claim to have been taken and experimented on. Some people and children remain missing without a sign. To have SETI continue is dangerous as they had already sent signals out there with our coordinance and information about our human anatomy. What makes SETI think they will be friendly is beyond me. If an intergalactic war breaks out causing the extermination and enslavement of the entire human species, blame SETI. Just early this year. NASA telescopes traced several huge crafts landing and stationing on our moon. There is no signs of threats yet, but according to leaked information, our government is very concerned. Along with the help of friendly ETs, AREA 51 research facilities for advanced weoponry against intergalactic threats is on the works, but not yet complete. Prev Earth to ET: I'm Not Listening! Next Is it Time for SETI to Stop Looking?